About Sales Generator - Who We Are & What We Do! Sales Generator (SG) is a business that was established to help people get online and list their business, services and products for FREE. We also provide a vast range of online services including Web Design & Development, Search Engine Optimisation and many others in order to help you sell/market your services and/or products on the world wide web. Sales Generators' pledge is to provide you with an "easy to use" web based business network to grow and enhance your business for FREE. Through Sales Generator we aim to assist you to leverage sales for your services or products on a Business to Business basis. By helping us, effectively become your passive business partner, we aim to build an internet platform that we can rapidly build and layer to interact with your needs as your business grows. We are focused on assisting you generate sales for your business. SALES GENERATOR should mean "wealth generator" if your Business to Business transactions are conducted successfully. SELL MORE PRODUCT or increase the efficiency of your business through the range of services provided by Sales Generator. LISTING YOUR BUSINESS, PRODUCTS and/or SERVICES FOR FREE is easy with our Business Directory Listings. 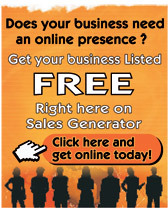 Want to List Your Business for FREE??? INTERACTIVE MAPS so customers can find you easily and with no fuss. PAID ADVERTISING targeted to specific end and niche markets will increase your sales online and offline. WEBSITE DESIGN & DEVELOPMENT SERVICES available at a nominal rate to create your new website or refresh your existing website. SEARCH ENGINE OPTIMISATION available at a nominal rate to enhance your current or new site search engine rankings to help generate sales. Sales Generator is all about YOU and YOUR business, stay in touch and contact us, we would be more than happy to help you reach your sales and services goals.